Kids love listening to music and experts say it might even help their cognitive development. Now there’s evidence that it may make little ones healthier as well! According to music therapists, certain tones, rhythms, and vibrations can help treat various medical and behavioral problems. Songs with soothing melody and steady rhythm can also calm a colicky or teething baby. For kids who have trouble following directions, try turning directions into rhythmic, catchy and sing-songy tunes. Rhythm is perceived differently by the brain, so kids are more attentive when you say things musically. 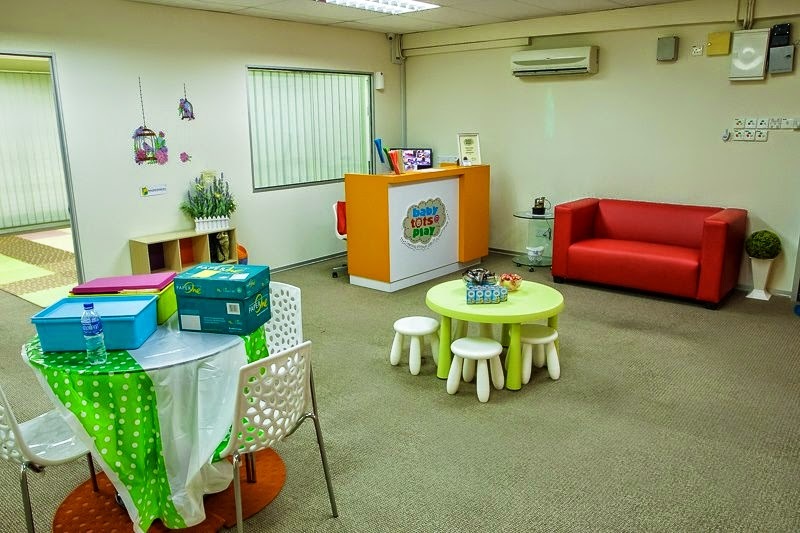 If you are finding a playschool for your little one around the Klang Valley, you may want to consider Babytots@play. Babytots@play offer fun & educational music and movement classes for babies, toddlers’ children for age group of 6 months to 4+ years old. 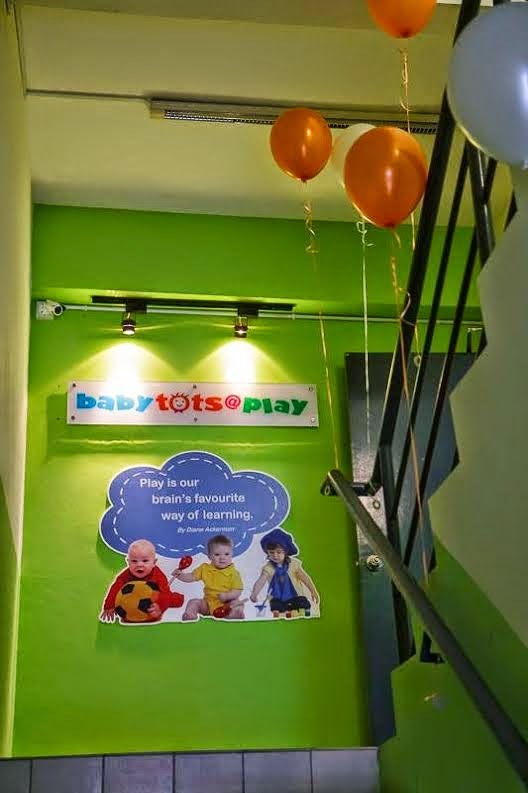 The programs are structured into Baby Boost ( 6months to 18 months old ), Happy Tots ( 18months – 30 months old ) & Boogies Tots ( 2 half to 4 years old ). You & your child will participate in the magical world of songs & melody while having lots of fun together. Early exposure to music is known to stimulate the brain development in babies & preschool aged children. At Babytots@play, they will move, dance and sing along to interactive music & songs. Both new & familiar music will encourage vocabulary growth & interaction. 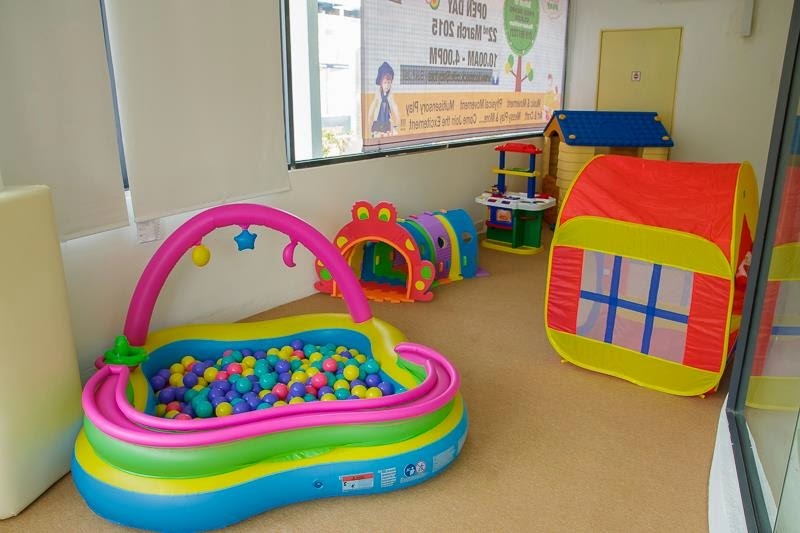 In each play class, the kids will explore an array of different musical instruments. 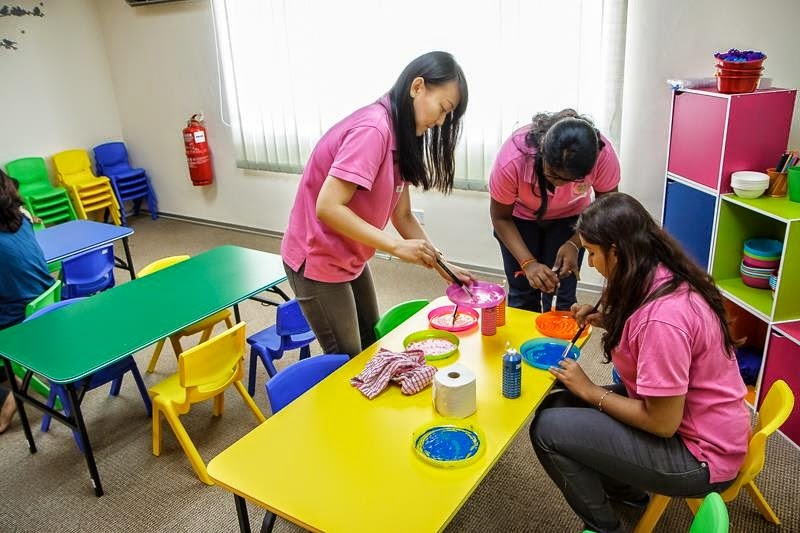 The programs have been carefully designed to enhance the motor & sensory skills together with all kinds of sensory props. For older kids, they interact with each other with role playing & dancing activities, which indirectly helps them to be more social & prepare them for preschool. 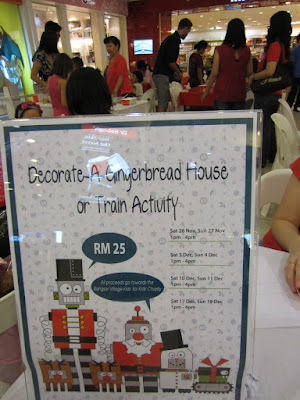 On top of that, for every theme, there is an interesting Art & Craft session to compliment the theme. 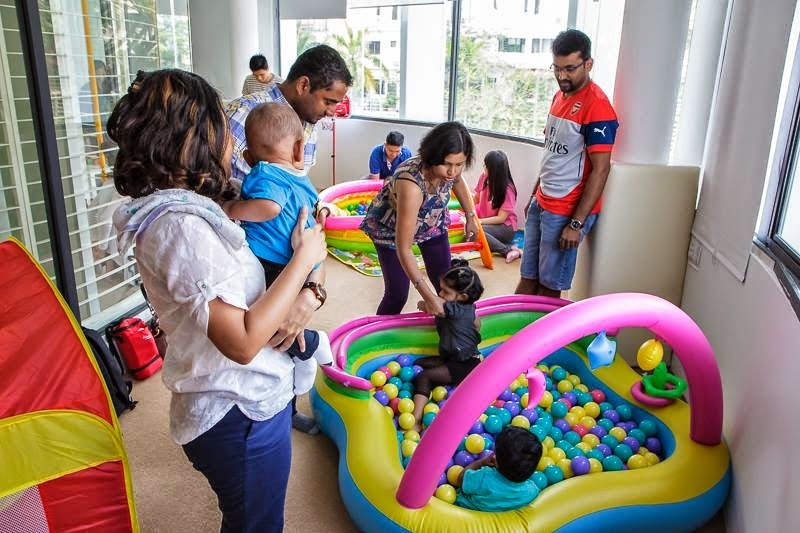 At Babytots@play, parents accompany their babies and toddlers on sensory journeys filled with all kinds of sensory prop, while older kids interact with each other amidst role-playing and dancing activities conducted by a team of experienced educators. 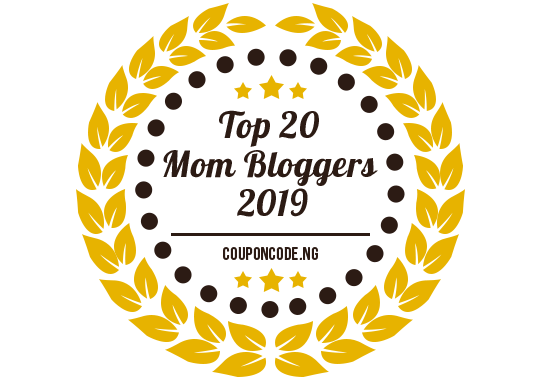 Music, movement, and crafts activities built around various themes. Sherilyn and Baby had a whale of their time constructing a house for the first time in their lives… and it’s a house that is totally edible, just like Hanzel and Gratel ! 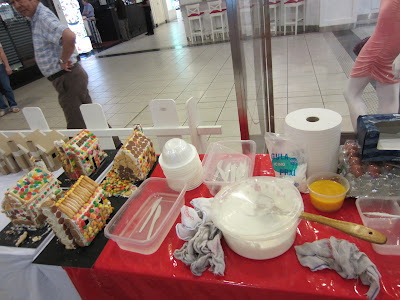 We were at Bangsar Village today and hubs saw this ‘Decorate A Gingerbreadhouse Charity For Kids’ activity on the first floor, just outside MPH Bookstore. Without any hesitation, he paid RM25 for a house for Sherilyn and Baby to construct! Construction materials consist of biscuits, M&Ms, hawflakes, Spin chips and cute fish biscuits. 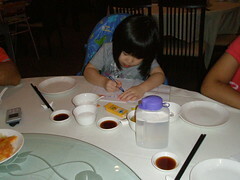 Any kid will go crazy over this activity but not Alycia, who preferred to shop for books at MPH. And yes, we bought her 5 books for X’mas and for her 8th birthday which falls tomorrow. Baby and Sherilyn spreading edible cream on the skeletal house before sticking biscuits and snacks on it. How cool and fun can this be eh? I would have gone berserk engaging in this activity if there were such a thing 30 years ago! 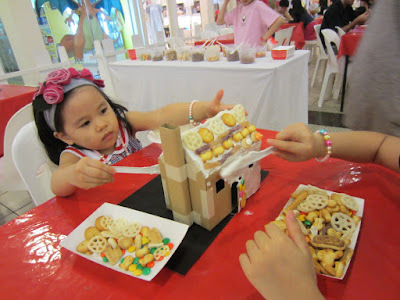 And this is the edible house which Sherilyn, Baby, mah mah and I built! Nice hor but….. after a jerky and bumpy ride home with cream and biscuits dropping off from the house onto the car… our helper dropped the house on the car park basement the moment she alighted from the car!!!!! It was a total disaster sight! Our 1 hour of hard work building the house was on the floor. Hubs and helper had to clean up the creamy mess too!! 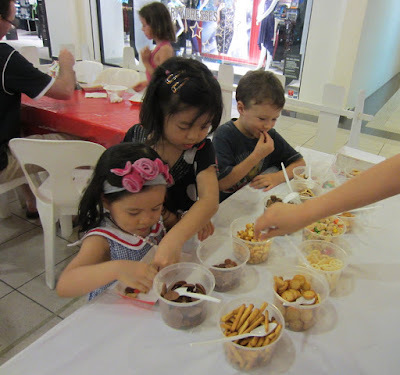 If your kids are interested in this charity even, quickly head over to Bangsar Village. 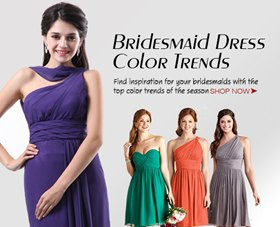 It ends on Sunday, 18 Dec 2011. Both my older girls attended 4 years of pre-school. Alycia started pre-school just after her 3rd birthday and Sherilyn at 3.5 years old. Sherilyn is in her last year of pre-school this year. For Baby, I’ve decided to delay sending her to pre-school until she turns 4yo next year. 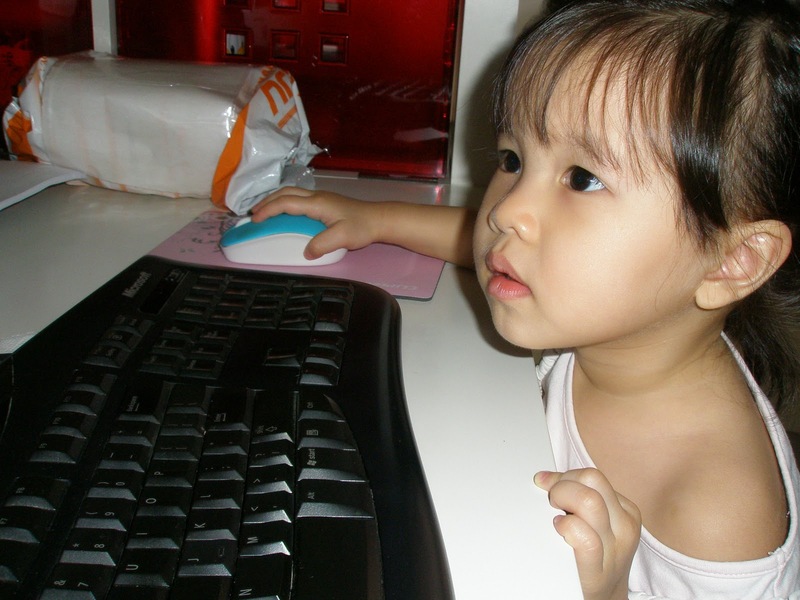 If you are a die-hard reader of my blogs, you will know that Baby still has a minor urinary problem despite having gone through 2 traumatic major surgeries in 2009. Only time will heal the entire urinary tract and I hope that by the time she turns 4yo, the problem will resolve by itself. Sherilyn can spend the whole afternoon reading from Starfall on the new laptop I got the girls and she never seems to get bored. While Baby loves learning her ABCs from the computer, I have to nudge myself to spare my time to teach her at least every other day. Once we are in it, she needs at least half an hour to an hour before she’s satisfied. Sometimes I just can’t afford to allocate my time to her. Yeah I know I know, I must prioritize my list of to-dos. Nothing is more important than my Baby recognizing her ABCs and learning to read. Whenever I am busy with work, Baby will play on her own if her 2 sisters are at school. 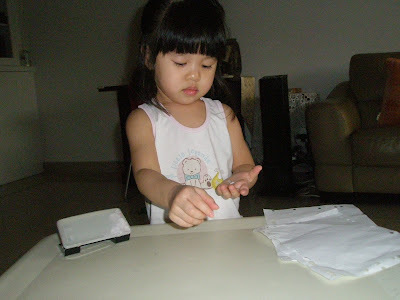 Some of the things that will keep her occupied are punching papers with a paper puncher, doodling, playing Lego blocks or she will simply climb up to the top of the couch and then slide down as if it were a slide! Sometimes she will bring out the vanity bag and play hairdressing on my hair, at the expense of my precious locks, with gobs of them on the floor after each session! The tellie is another good babysitter but I am not too keen in allowing her to watch the idiot box the whole day. Sometimes she gets so engrossed watching that she will shut her ears to my calls. The same goes with my 2 older girls. I have now set a max of 1-2 hours of TV viewing on school-going days for my girls. Another item that will surely hold this rascal’s attention is the scissors. This fella will climb up on a chair to grab the nail trimming scissors for babies from the top of my shelf, then crawl under the chair or table (when I am busy at work and may not have noticed her) so that no one can spot her. She will then happily cut papers with the pair of scissors! I made a batch of banana and orange crepe early this week. 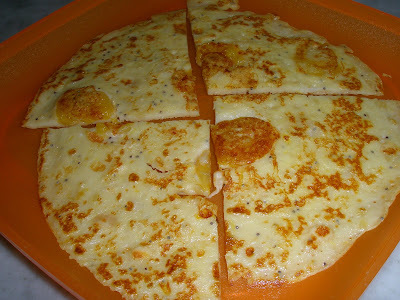 Though I had made them without referring to any recipes and had just mixed all the ingredients together without any proper measurement, the crepes turned out very well and were a big hit with the gals. 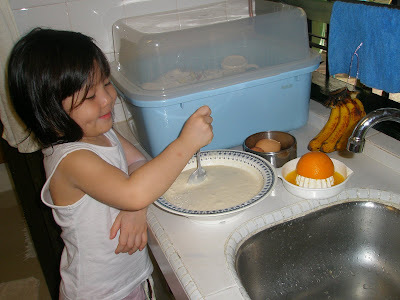 Alycia who loves cooking never fails to volunteer helping me in the preparation of the crepes. 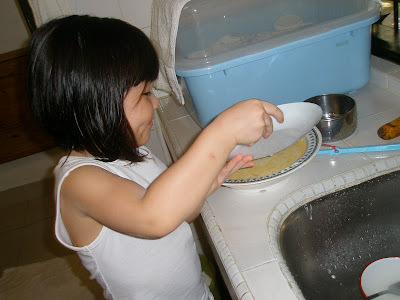 First she helped me stir all the ingredients. 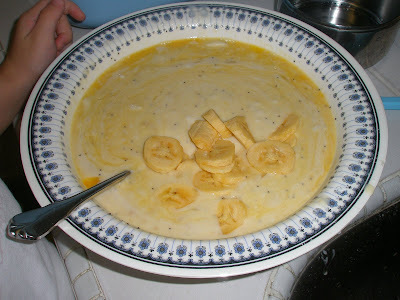 Then she helped me pour the sliced bananas in. The batter ready to be pan fried. Want the recipe? 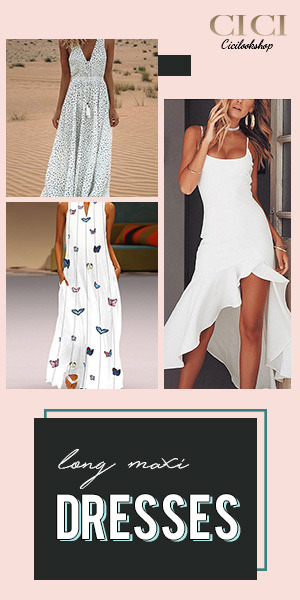 Hop on to my other blog to get it. When Alycia and Sherilyn’s interest in flash cards were waning early this year, I found it really hard to hold their attention when I flashed the cards to them. I was practically forcing, bribing and my temper flared too. I decided the flash cards needed a respite for a few months and kept all of them. Several days ago whilst rummaging the drawer, Alycia dug out the boxes of flash cards and asked me to read to her. 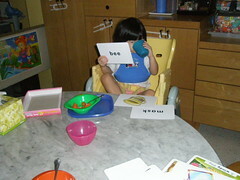 I gladly read to the gals during breakfast and I also took the opportunity to teach them phonics. 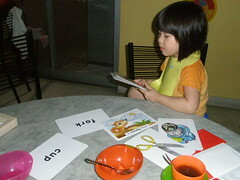 Alycia’s reading has improved slightly over the last few days as I have intensified the reading program with her. I’ve also resumed the Peter & Jane series books with her. Her interest in reading is still not as enthusiastic as I would want it to be but she’s definitely improving. After encountering problems with keeping my 2 brats still at restaurants while waiting for the food to come, I came up with the idea of bringing along ther exercise books and some crayons and color pencils for them to draw and write to keep them occupied. 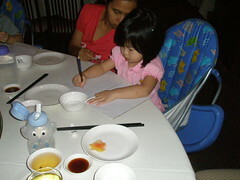 So far, my gals love this activity and I can keep them still for at least 20 minutes before the food arrive. Alycia and Sherilyn can hardly sit still during meal times, especially during breakfast when their energy levels are at the highest in the morning. 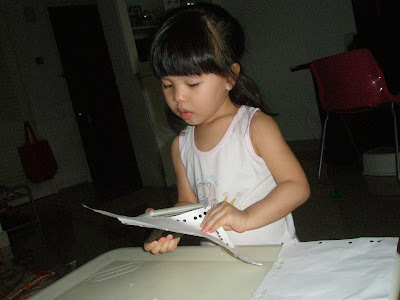 To keep them still on their chairs, I have to provide them with some activities like drawing, scribbling, reading or coloring whilst my maid and I feed them. My mom and I had bought them a huge collection of activity books from letter tracing to number tracing, coloring and joining numbered dots and letters. Each morning, the gals choose the activity that they like and they can spend almost an hour all wrapped up in that activity. I find that their concentration levels are also at the highest in the mornings, so I normally read to them in the morning to capture the most of their attention. Crawling (like commando crawl) and creeping (on all fours, i.e. on hands and knees) are highly advocated and encouraged by Glenn Doman (GD) for the development of a baby’s brains. 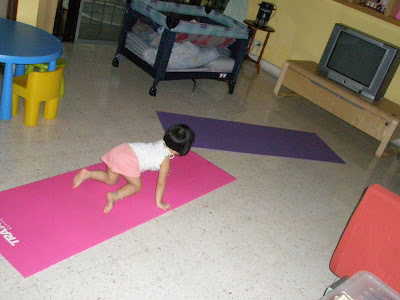 I used to be a pro-GD and practised the GD inspired programs with Sherilyn since she was a newborn. When I first had Alycia, I hadn’t discovered GD yet. It was only when Alycia was around 6-7 months that I had discovered GD and I then started to make homemade flash cards to teach Alycia reading. Sadly, she didn’t show much interest as I had started her a little too late. With Sherilyn, I started flashing words and math dots cards to her when she was 2 months old and I encouraged lots of tummy time even when she was a newborn. Tummy time will lead to early crawling which will in turn lead to creeping. Sherilyn turned out to be more advanced than Alycia in many areas. Till today, I still encourage Alycia and Sherilyn to creep on gym mats on the floor whenever I have the time. To encourage the gals to creep, I too have to creep along with them. It is proven that crawling and creeping as well as walking and running (all in great amounts) have helped improved speech development in toddlers. If you visit the GD website and the Childbrain forum, you will be amazed with how the GD programs have had success with so many kids worldwide. So if you’re lost with activity ideas with your kids, go get some gym mats and play crawling and creeping games with them! 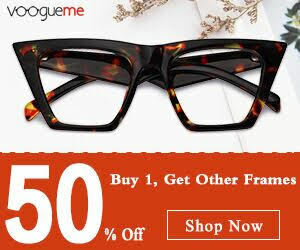 Hey, this is not a sponsored post, ok! 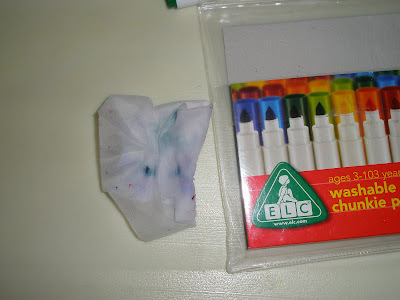 These are the washable ELC magic color chunkie pens that my sil bought the gals from Hong Kong recently. 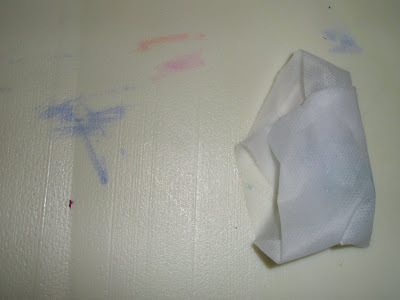 The ink comes off super easily when wiped with wet wipes and does not leave any stains behind. 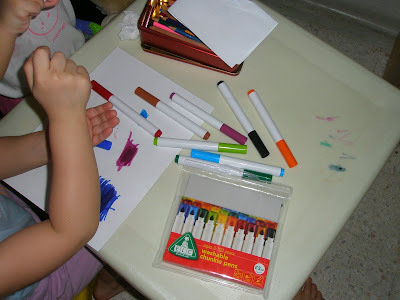 Yesterday, the gals were drawing with these magic color pens and they stained their hands and table. I used wet wipes to remove the stains from their hands and table and I was so glad that the stains could come off very easily. No scrubbing was needed. The magic color stains on the table. Just use a piece of wet wipes to wipe off the stains. The stains came out easily when wiped with wet wipes. Notice how clean and shiny the table is after I’d wiped it with the wet wipes. Alycia has always loved the story Noah’s Ark. She liked it even more ever since she watched the movie Evan Almighty, a rendition of the modern Noah’s Ark. Yesterday as Sherilyn was sitting on her potty doing her poopie business, Alycia took out a cloth book on Noah’s Ark (which I had bought for her years ago from my church), pulled out a stool to sit next to Sherilyn and began ‘reading’ to her sister. Alycia certainly did a good job as she even mimicked the way I normally read to them, i.e. pointing to the words as I read. After daddy had sculptured the sausage-shaped balloons into animals, flowers, a disfigured Pink Panther and swords for the gals several days ago, the gals had fun playing with them for the next few days. The stalk of the flower-shaped balloon had burst, so I transformed it into a flower-shaped balloon hair clip for Sherilyn. Alycia decorating the disfigured Pink Panther balloon with magic color. This is quite messy though as the ink comes off easily from the balloon, thus staining everything in contact with it. When I need to get some work done on the computer, I’ll assign some activities for Alycia and Sherilyn. What they love most now are puzzles, colouring, scribbling and playing with stickers. I have to separate Alycia and Sherilyn so that Sherilyn will not mess up her sister’s work. When she does, a war will break out. I let them stick stickers in a note book and they have so much fun with it. I had just created this new activity as I do not want them to stick those stickers everywhere in the house. I’m really proud of Alycia.